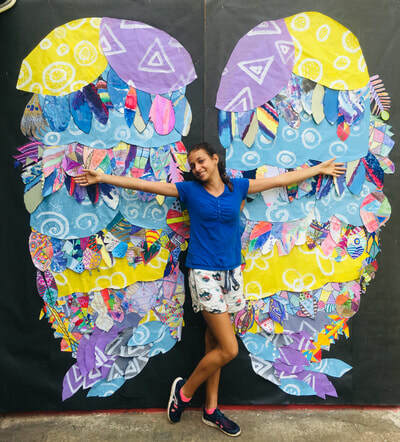 What Lifts You is a community art project, made by international street artist, Kelsey Montague. 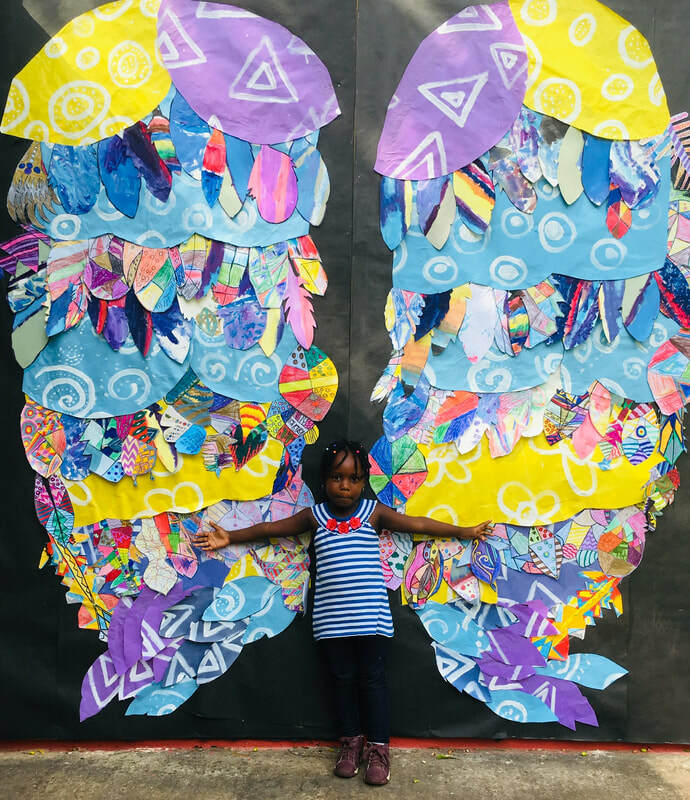 She became known for her giant winged mural on the side of a building in New York City. 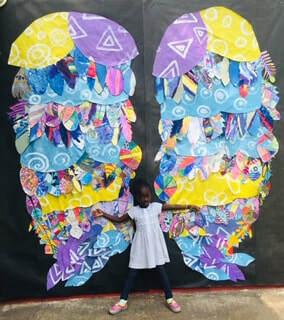 She made this art piece for people to interact with and be inspired by. 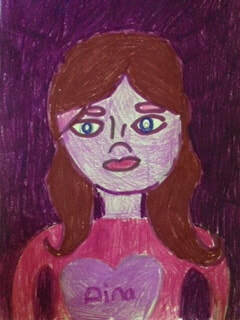 As a kid Kelsey Montague liked drawing patterns. 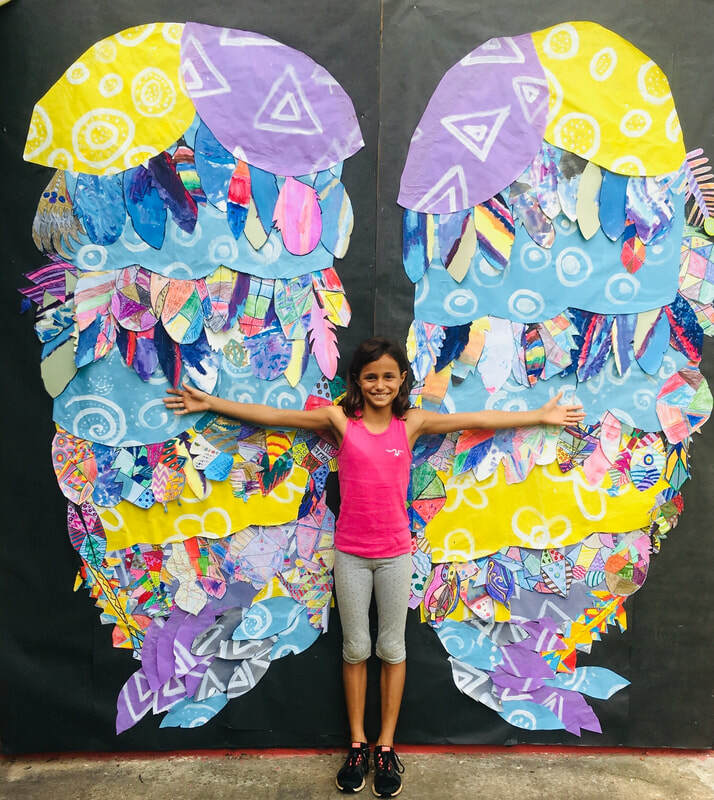 She fills the wings of her What Lifts You art pieces with patterns using places or things that are very common to people. 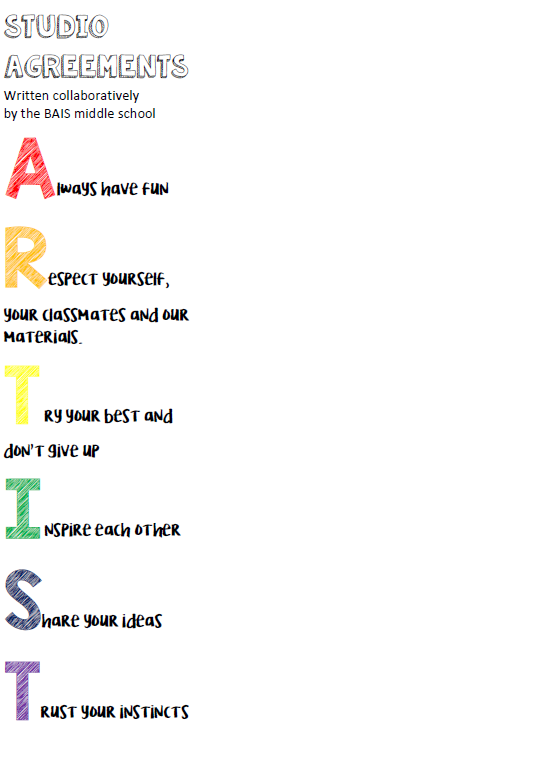 Things like pizza, buildings, or Christmas decorations. Kelsey Montague likes using social media to spread the message of the What Lifts You pieces. 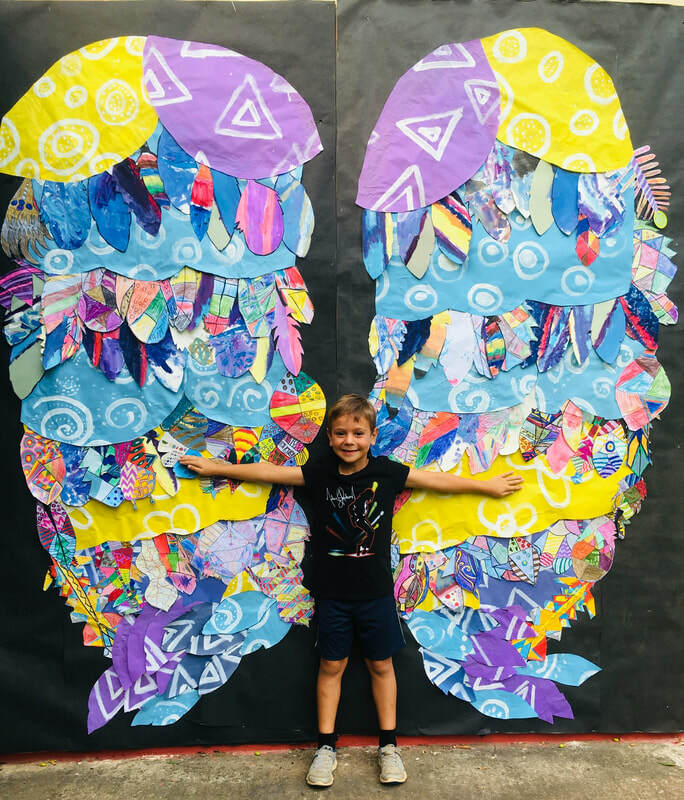 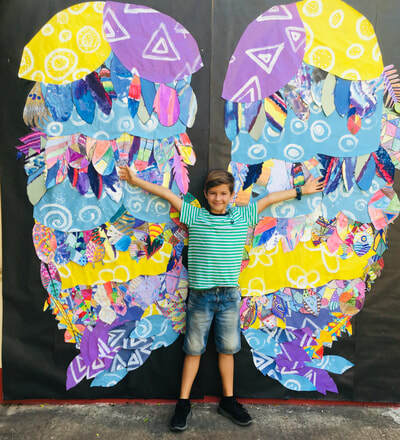 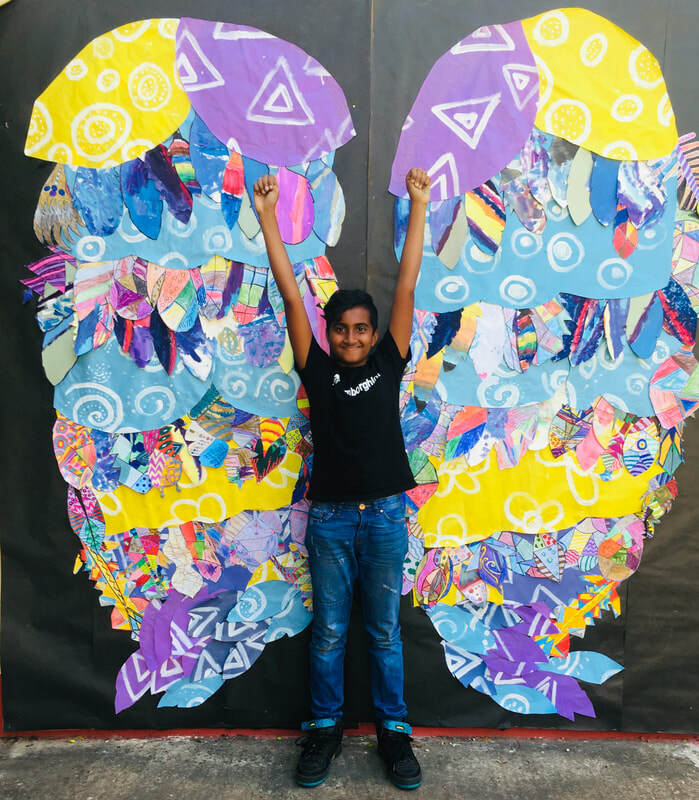 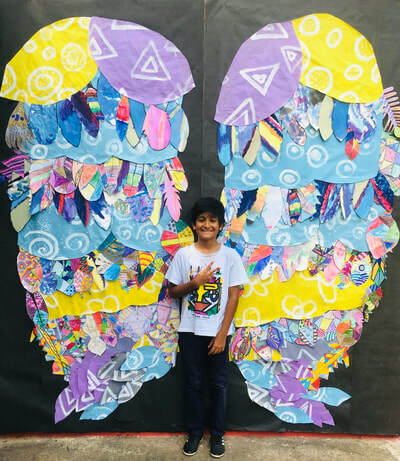 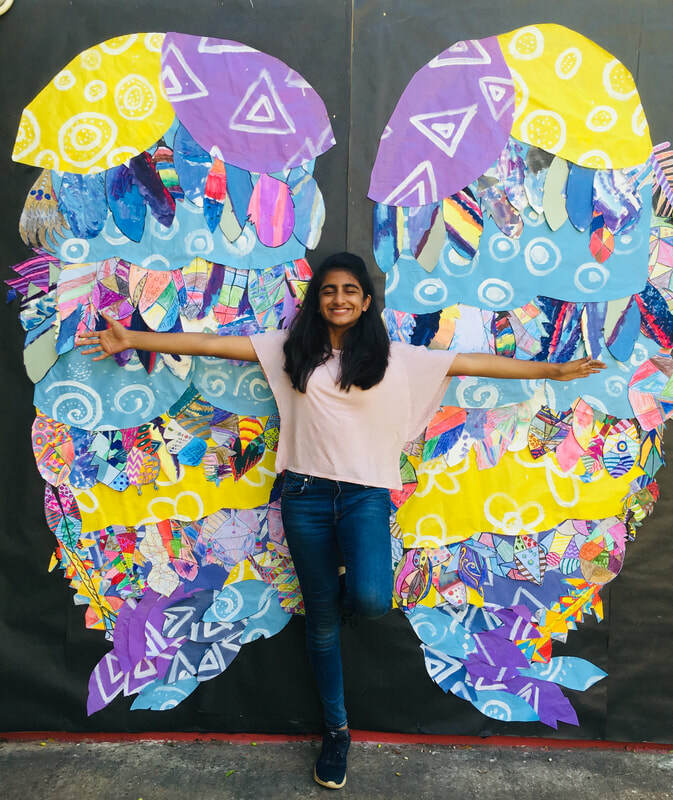 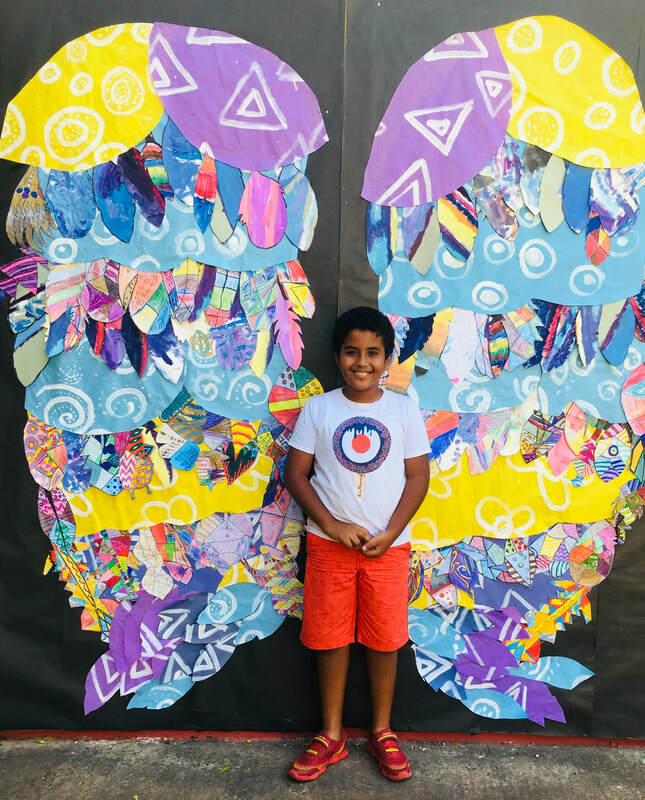 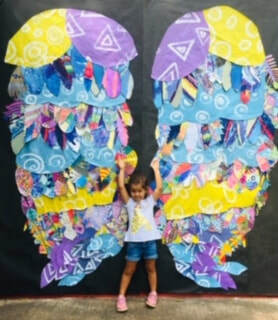 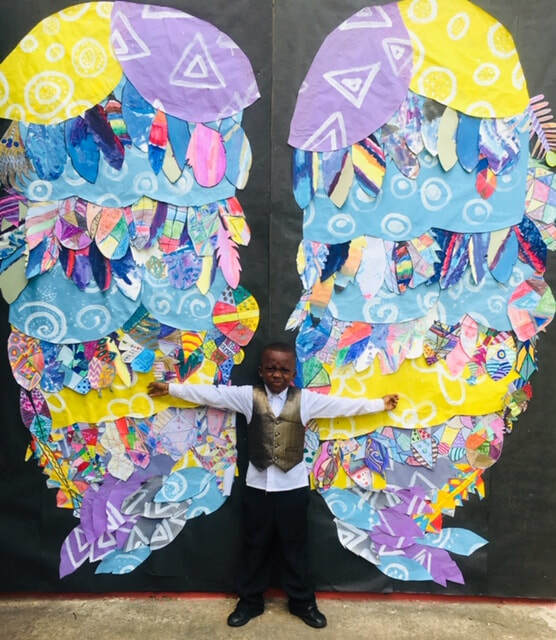 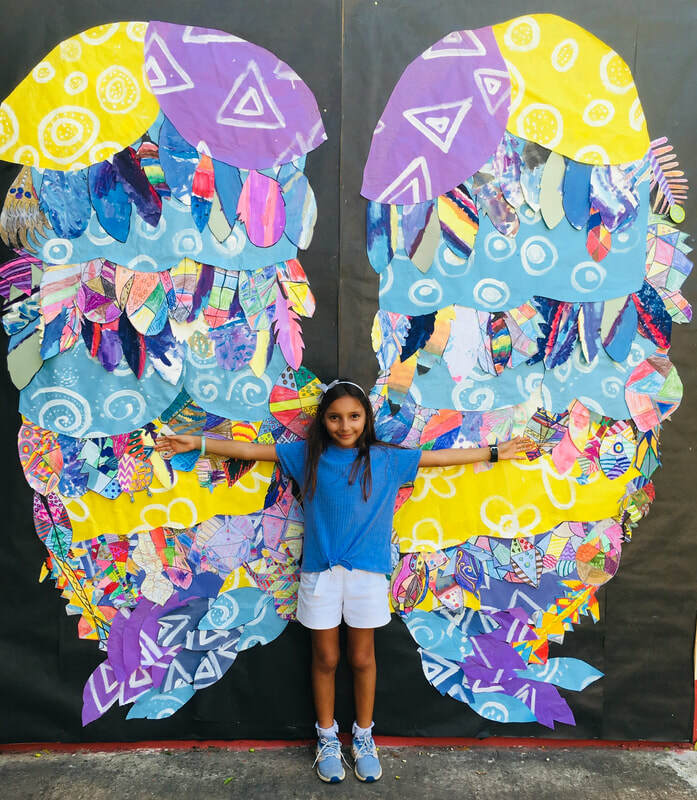 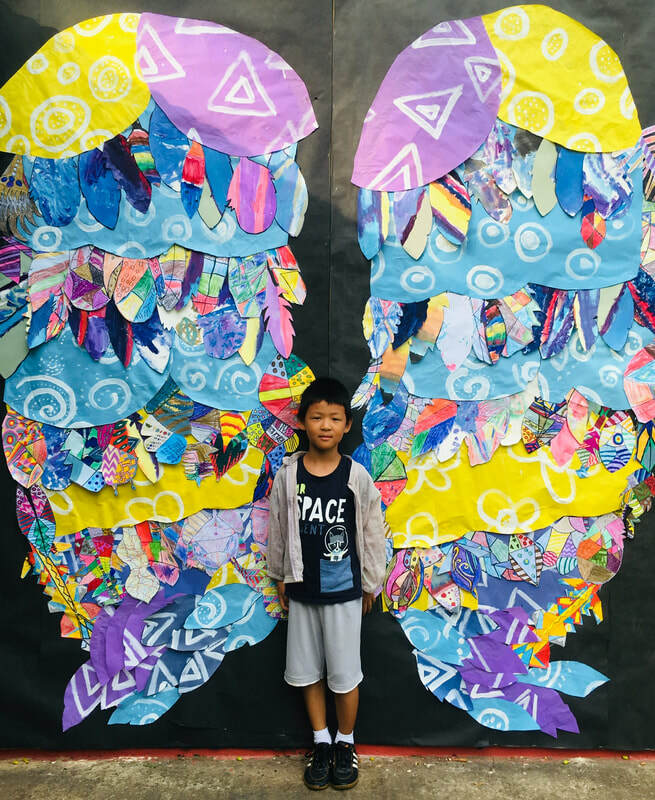 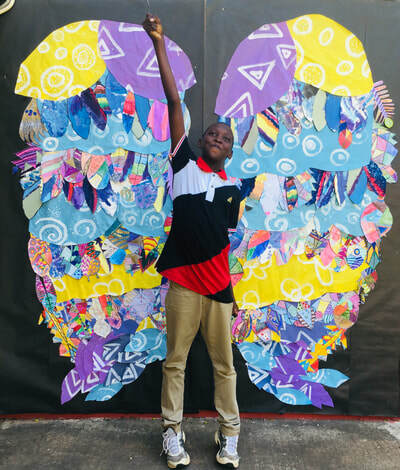 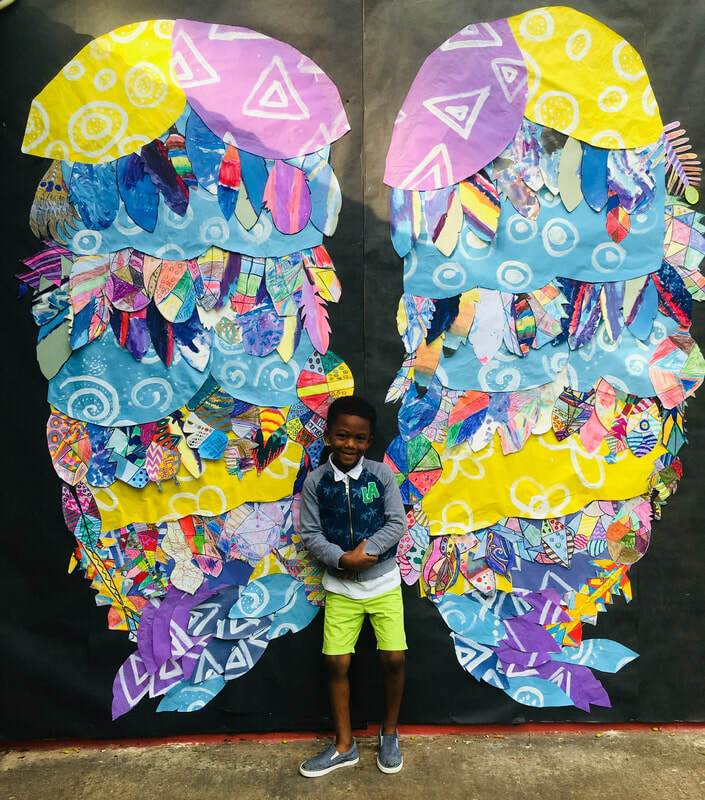 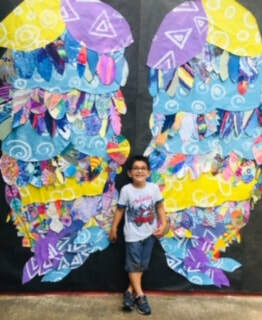 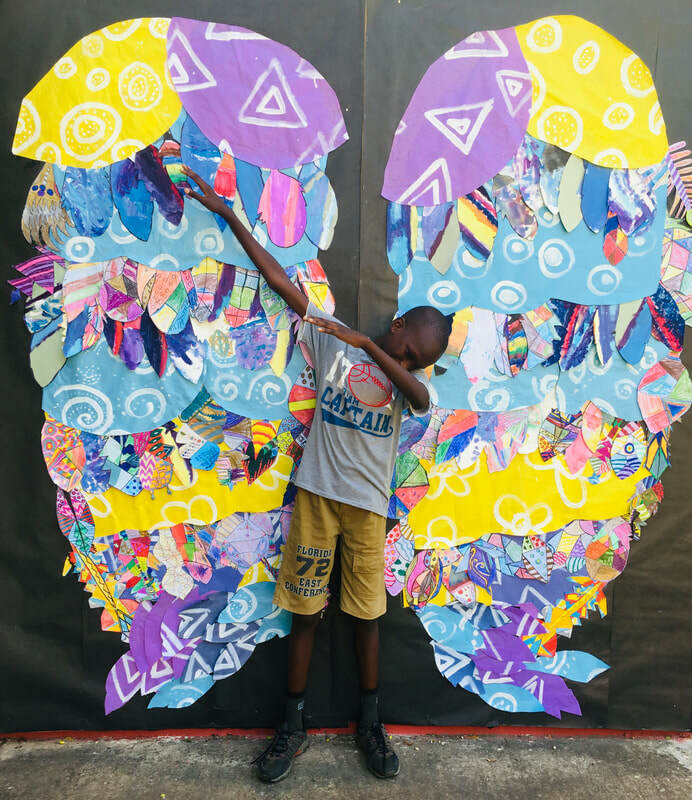 People take their pictures in front of the wings and use the hashtag “whatliftsyou.” – Amat, Grade 7. 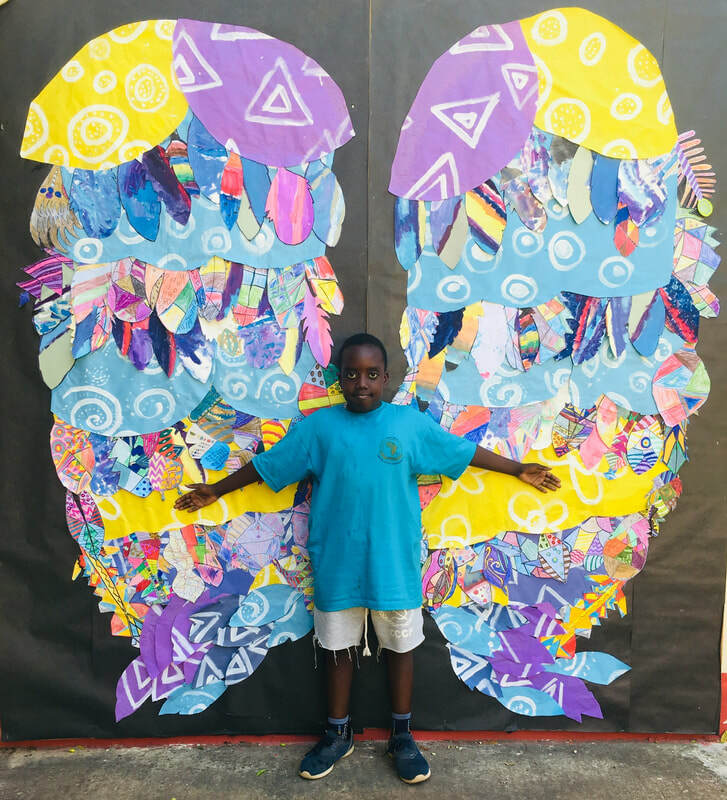 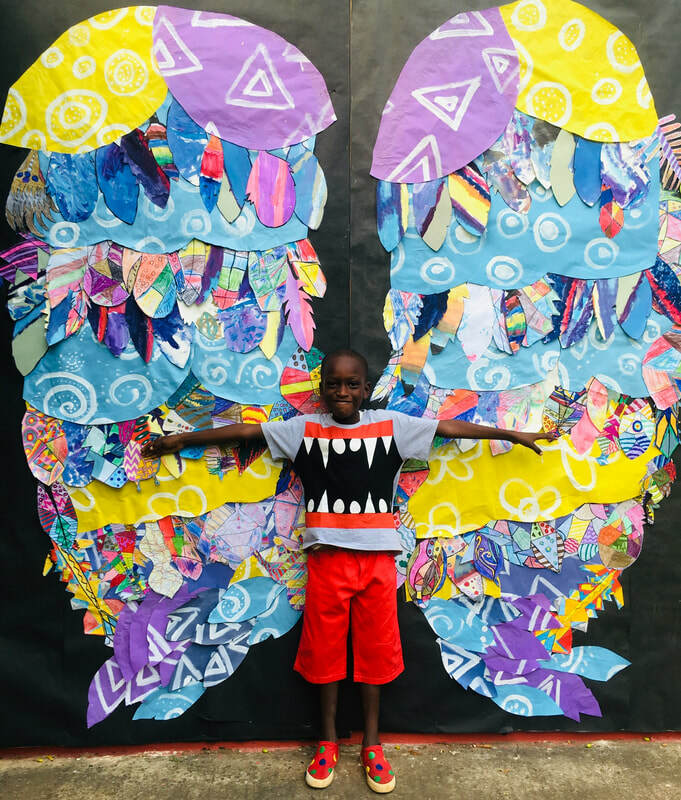 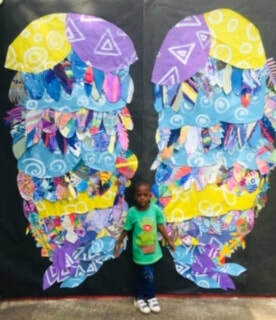 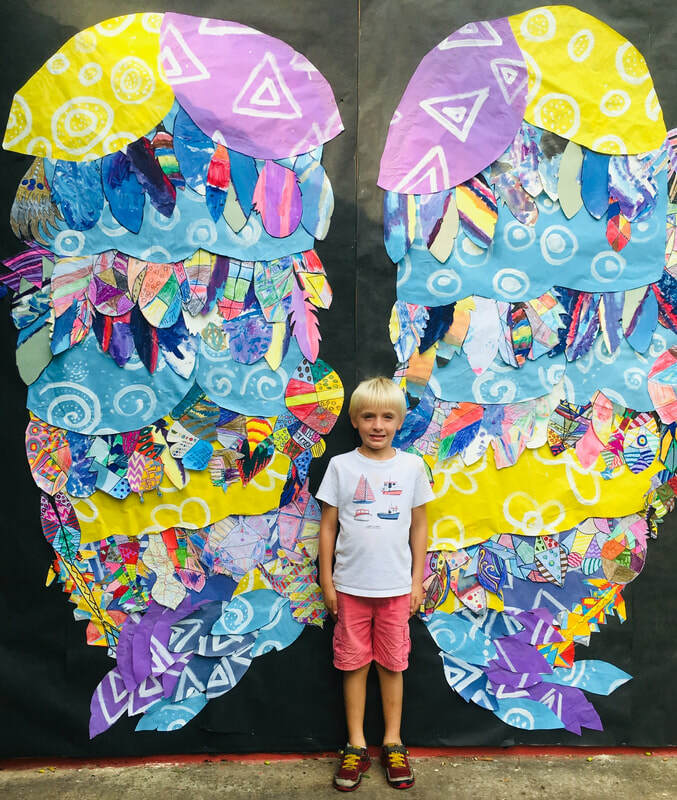 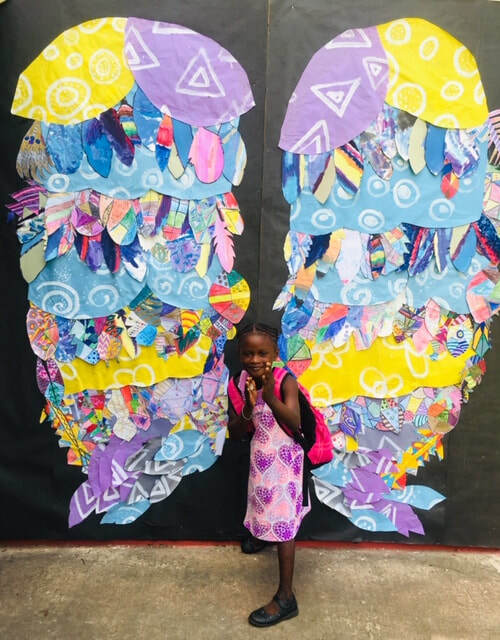 We were inspired by Kelsey Montague’s art and decided to make our own wings at BAIS. 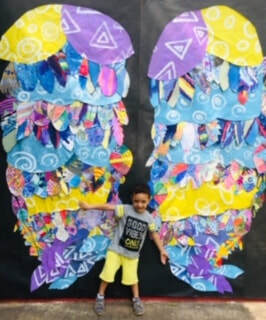 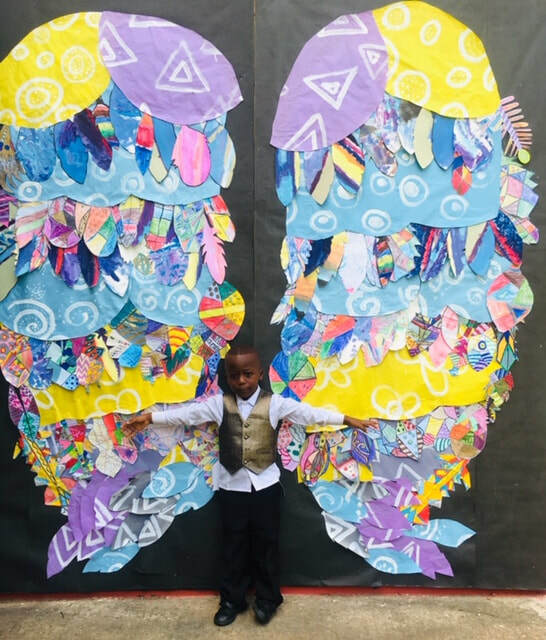 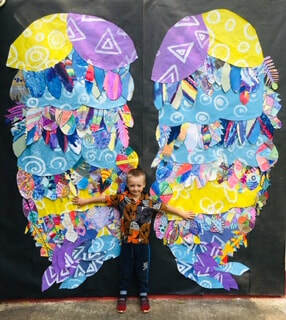 Students from all grades drew feathers for the wings. 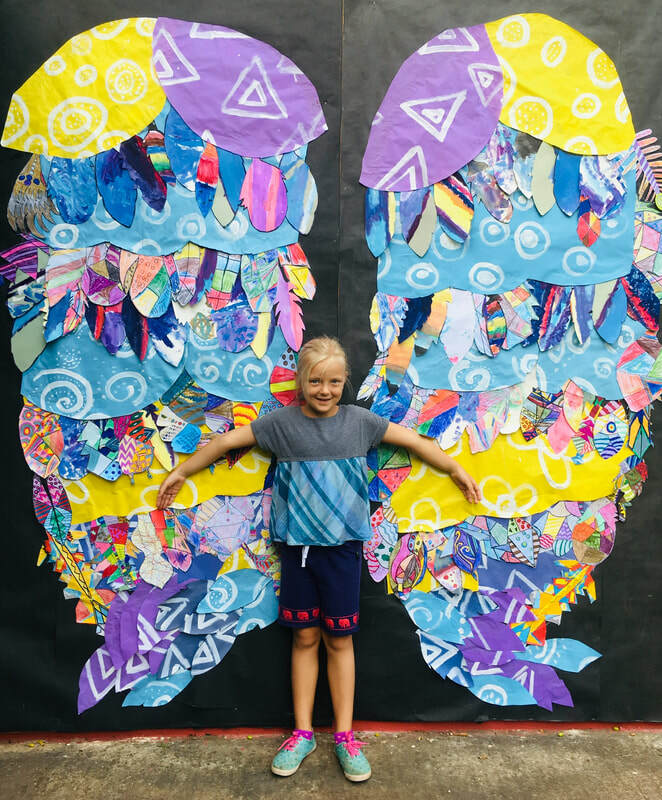 Every student created at least one feather using line, shape, color, and pattern. 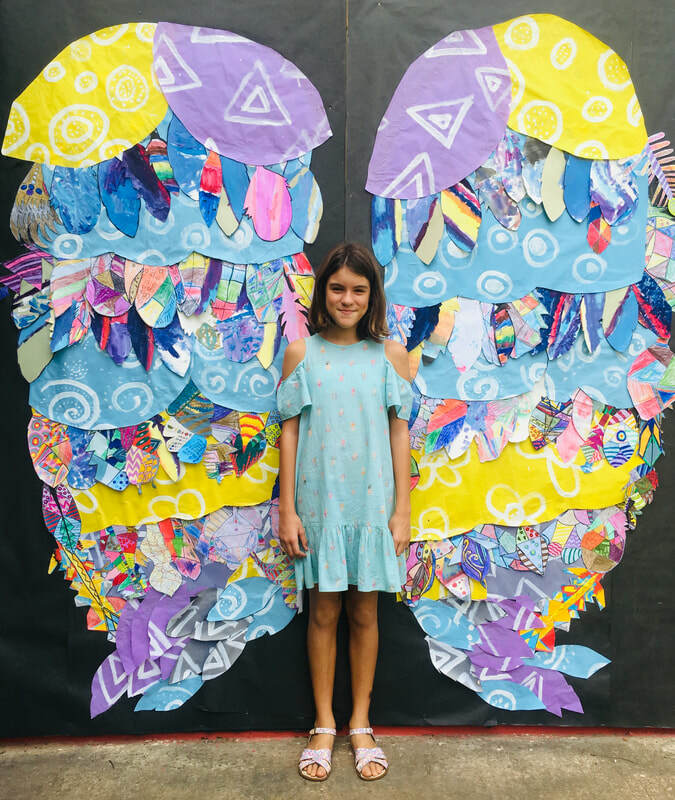 The 7th and 8th grade class arranged the feathers with patterned paper to create the wings. 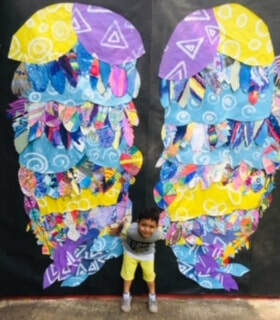 Now they’re at the back gate so everyone can take their picture in front of them! 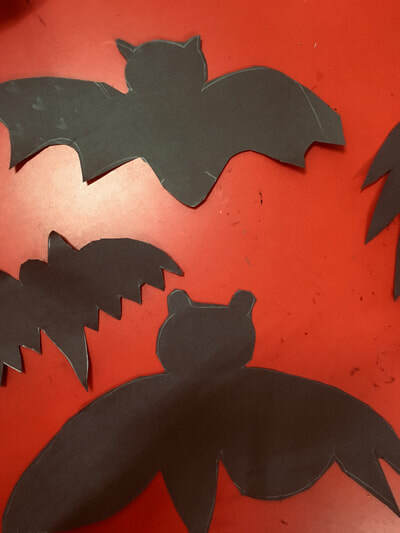 Decorations are underway for the Halloween party on Friday, November 2nd! 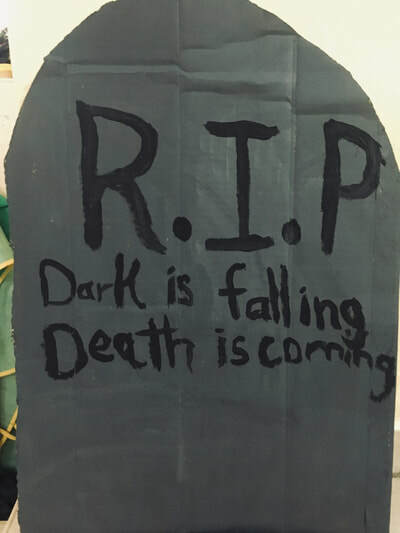 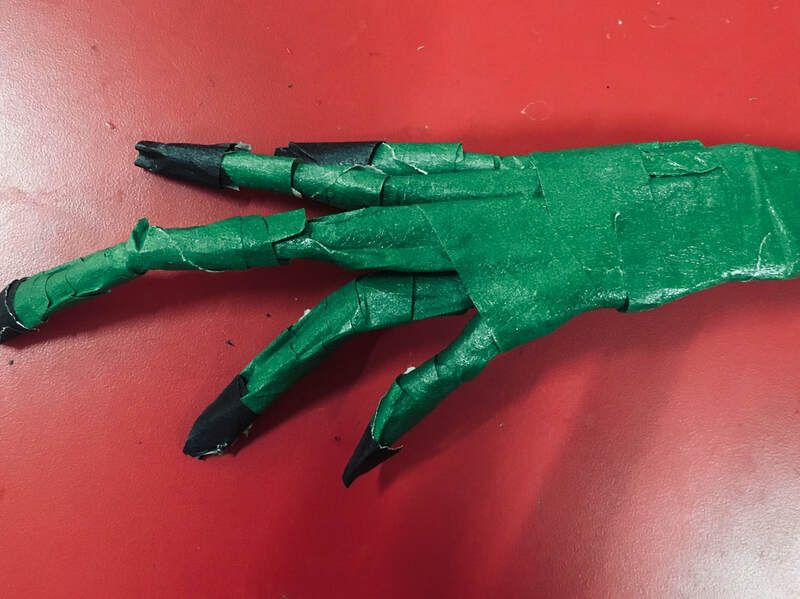 Student Council is ready to make the spookiest haunted house ever, and BAIS artists of all ages have been coming to the art room during their breaks to help out. 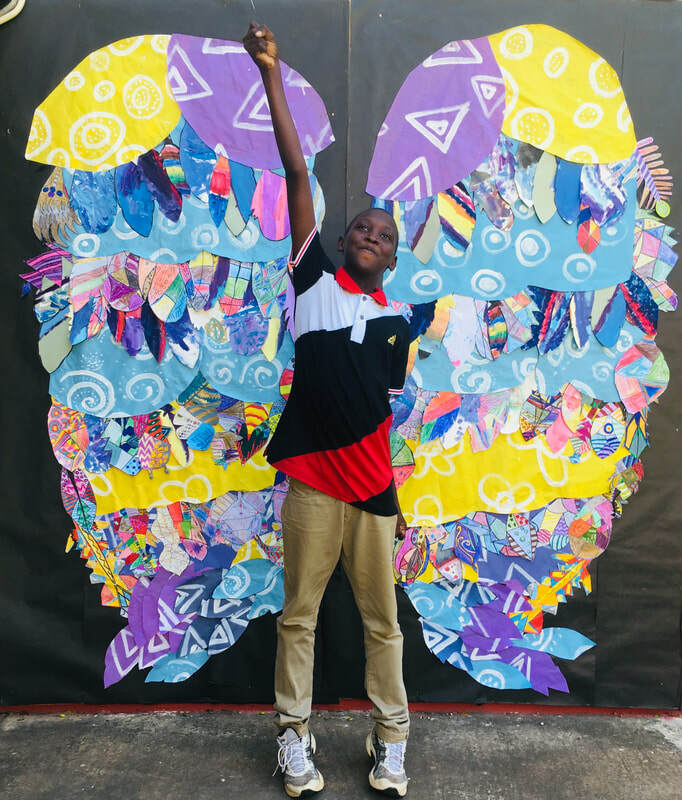 We are so grateful to have the amazing Njogu Touray leading an after school activity this trimester. 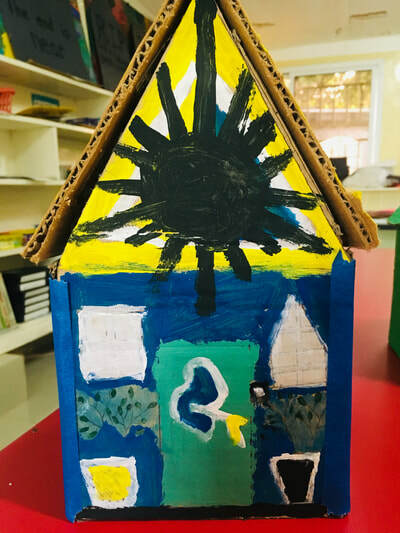 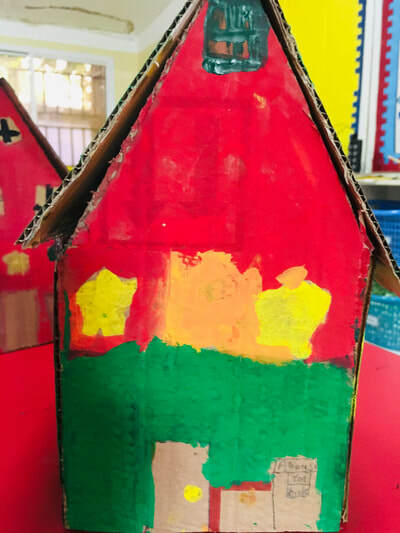 Take a look at the bright and beautiful houses that students are making with Njogu! 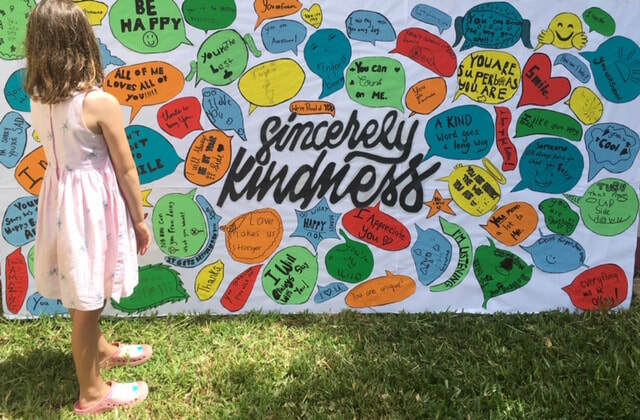 In honor of this month's Character Education traits -- Kindness & Generosity -- BAIS students have been working on another giant collaborative art piece! 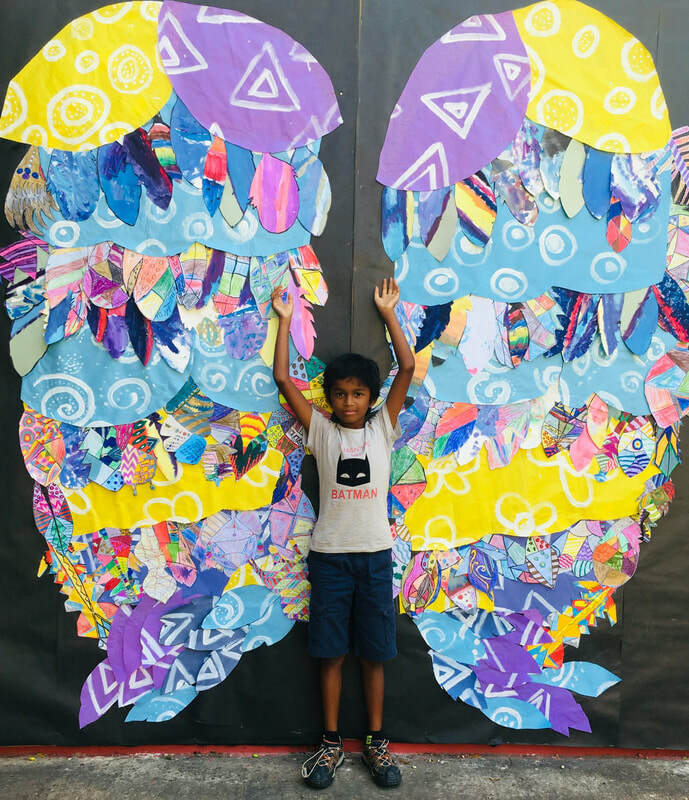 This one was inspired by an installation created by kindness.org in New York City and London for World Kindness Day. Come by and see it outside the art room. 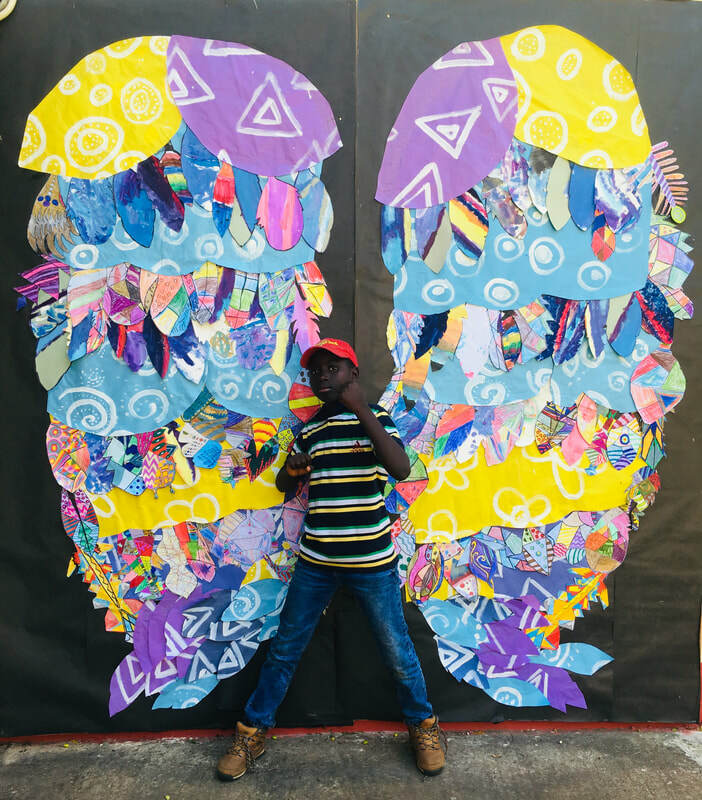 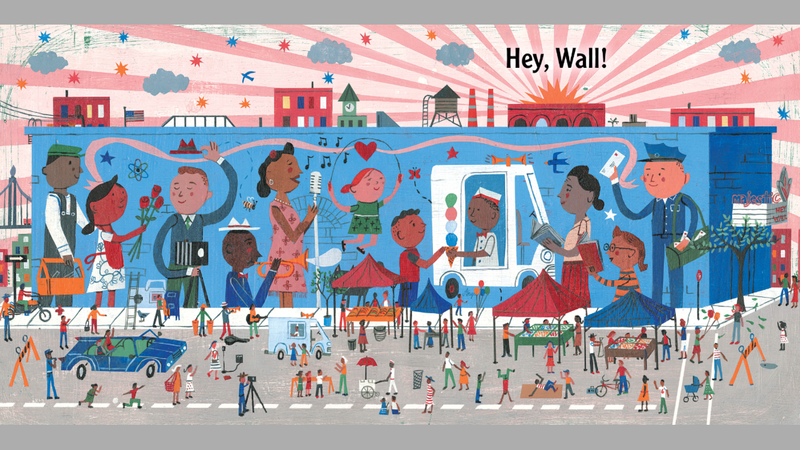 As part of our unit on Art and Community, students in every grade are creating a collaborative mural inspired by international street artist, Kelsey Montague. 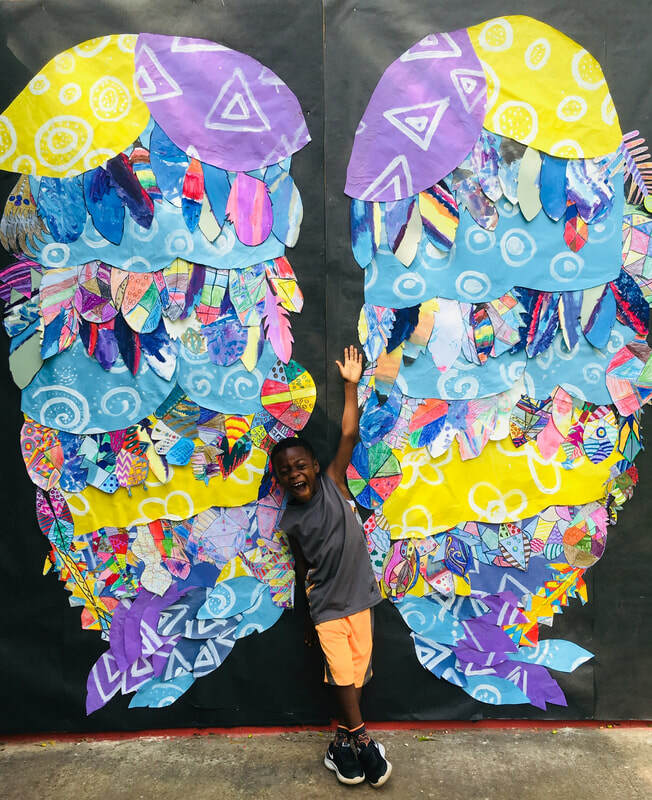 Students have been hard at work (extremely hard at work...the art room has been busy during recess and lunch time!) 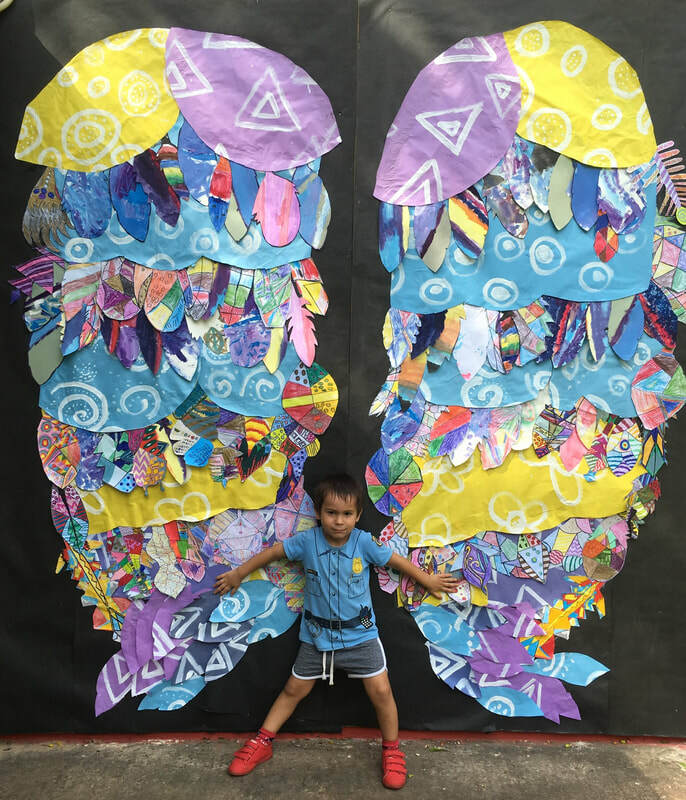 using their understanding of art elements to make beautiful, unique feathers for our mural. 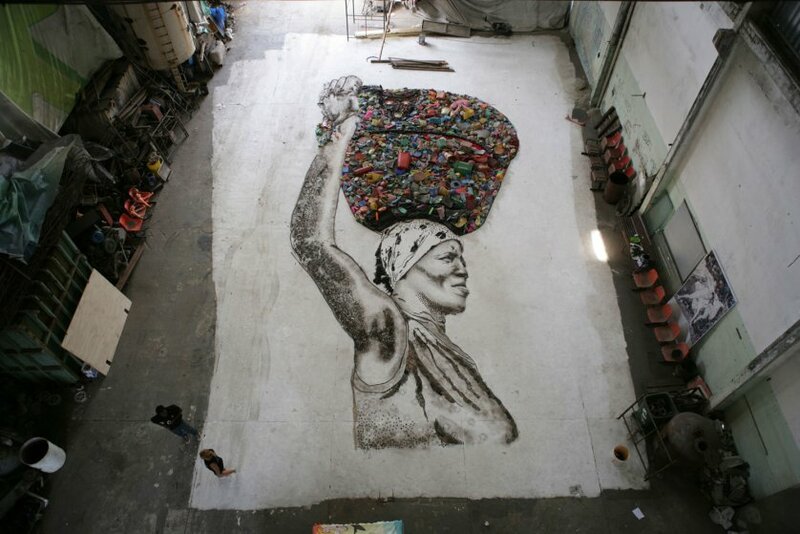 ​I can't wait to see how the final piece turns out! 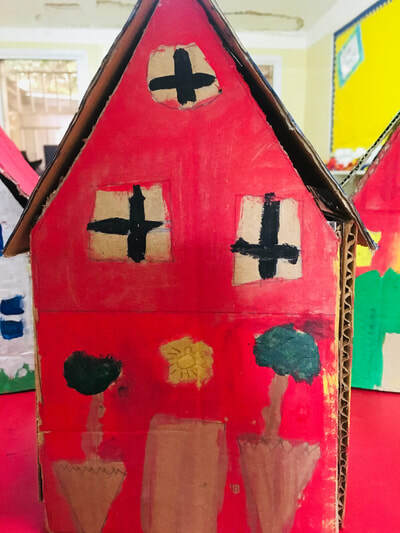 This trimester, all of our BAIS artists are exploring the connections between ART and COMMUNITY. 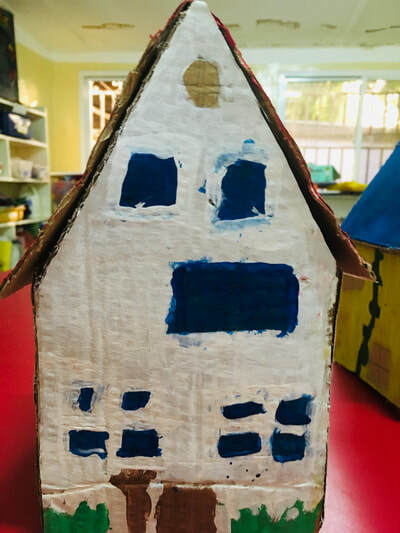 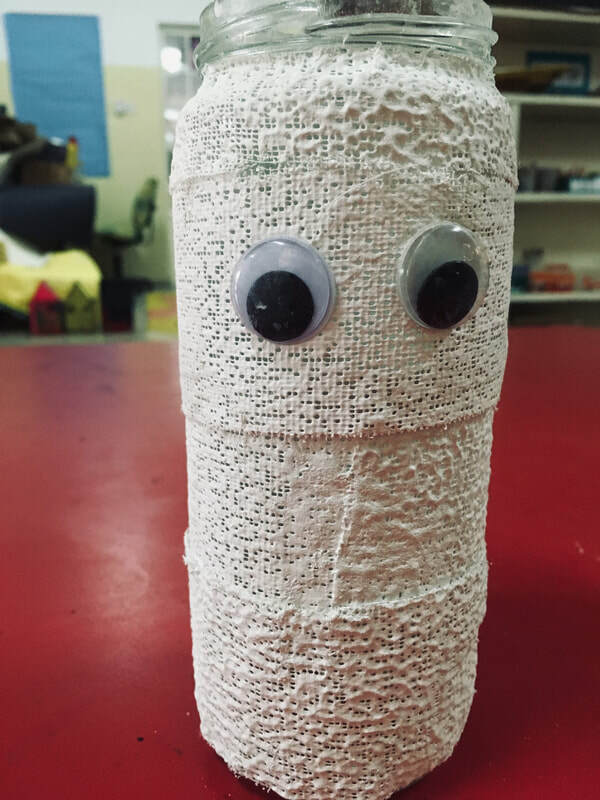 Our early childhood and lower primary students are looking at, thinking about, and making art together to better understand how art helps us build community and connect to the world around us. 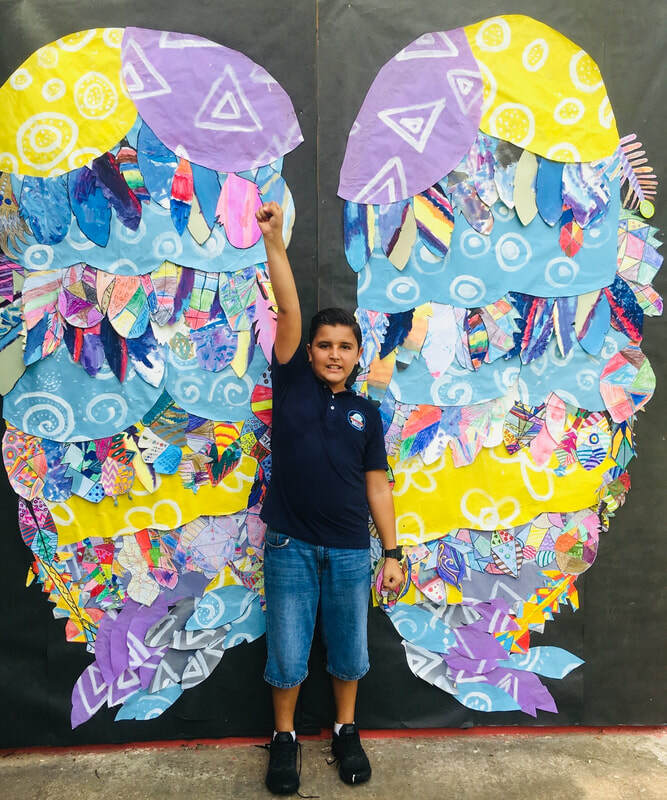 Middle School students are exploring how Visual art can be a powerful tool with which to engage communities in various levels of change. It can promote civic dialogue, contribute to economic development, transform physical spaces, and inspire community action. 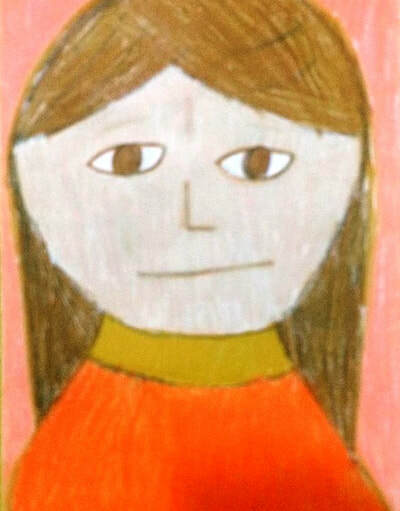 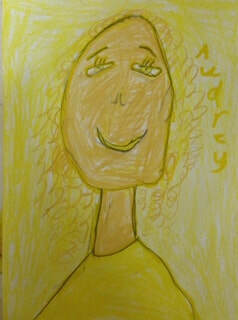 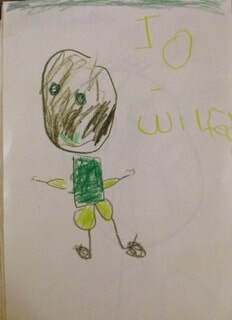 Every BAIS artist kicked off the year with a monochromatic self-portrait! 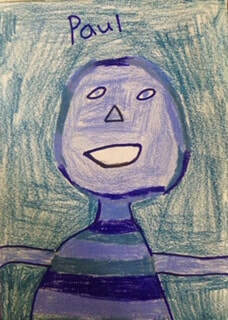 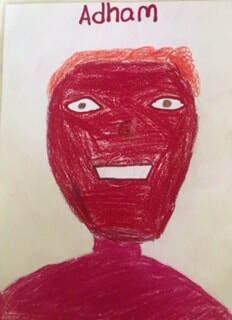 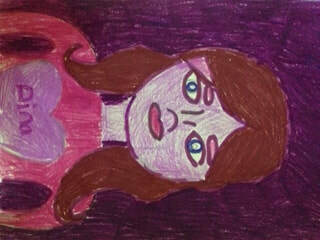 Students were challenged to draw themselves in only one color, though they could use as many tints and shades of the color as they wanted. 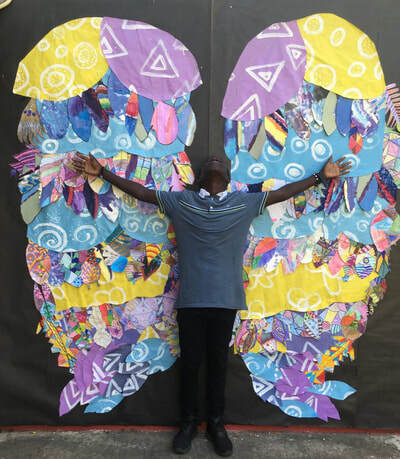 Come by the art room to see the stunning results!